Funko is a very dynamic toy maker. They get licenses to make toys for almost everything, from tabletop games to obscure vintage cartoons, be it bobble heads, vinyls or proper action figures. On the action figure front, I was keenly interested in their 6-inch scale Legacy Collection , which covers a wide array of cool intellectual properties. One such property is the critically acclaimed video game Skyrim, developed by Bethesda Software and released in 2012, being the fifth in The Elder Scrolls series. 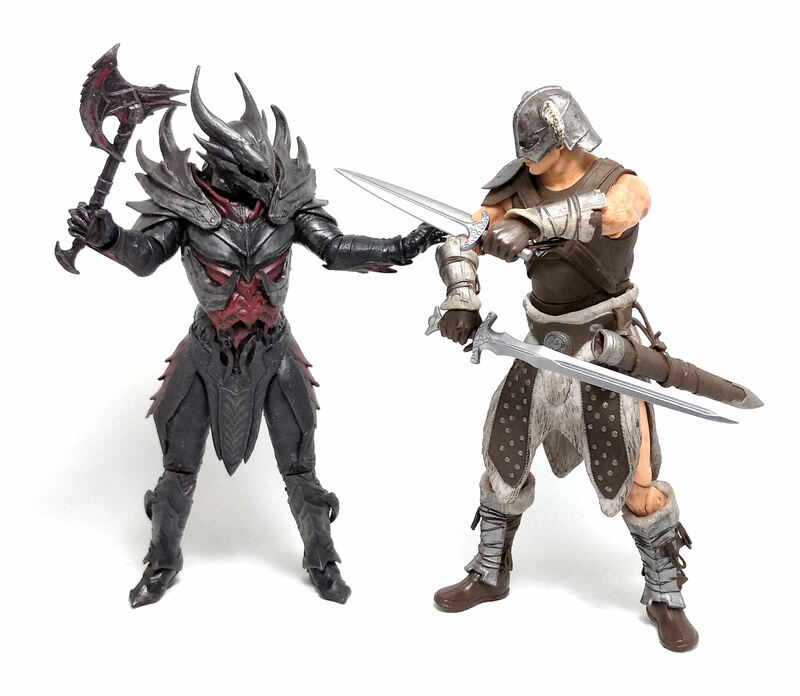 From this game, Funko saw fit to produce two action figures, one of which is the subject of today’s review, the evil Daedric Warrior. The Daedra are the main destructive force in the world of The Elder Scrolls, often characterized as daemons or dark deities, even though this Daedric Warrior is more of a foot soldier than a mastermind villain type. The armor design for this Warrior Guy embodies and distills all the common traits we have come to expect from a sophisticated, evil fighter class ever since we saw WETA Workshop’s design for the Nâzgul from the Lord of the Rings trilogy of movies. Set of pointy armor? Check. Asymmetrical helm design? Check, Somber color palette? Check. However generic this character design might appear to be on paper, the overall appearance of the Daedric Warrior is actually very beautiful, in a twisted sort of way. • Pin & disk wrists. • Ball jointed hips (T-bar design). • Pin & disk ankles. 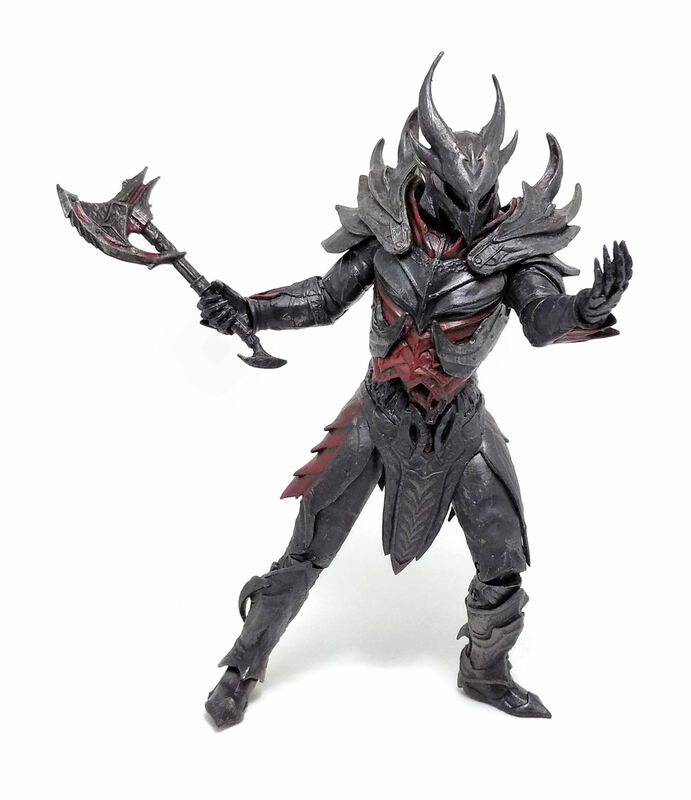 Most of those pointy armor pieces are made from very flexible plastic, the Daedric Warrior actually has a much better articulation range than I expected, with one caveat. Since the skirt piece is also made from a soft, flexible material, I found out that the skirt piece began to tear at the back of my figure after a few days of being out of the package. This seems to be an issue with the plastic quality used for this figure, as it seems the material began to dry up and contracted over the body of the figure. Which brings me to a really big issue I had in terms of quality material. 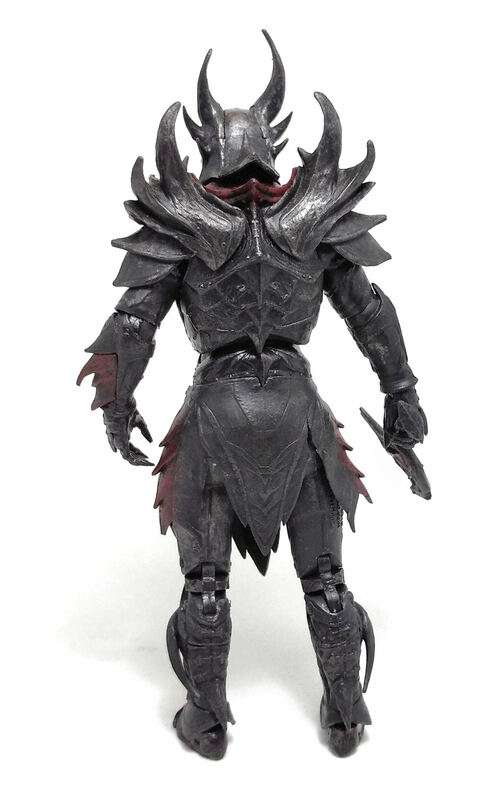 Both legs on my Daedric Warrior fell off as I carefully took it out of the package. It was not as if the plastic T-bar that held the legs was broken inside the blister or anything , they just snapped of as I began to test the articulation. Fixing them was a relatively easy task, pinning them with a length of wire going through the broken fragments, but the shrinkage of the skirt and the subsequent tear in the material really annoyed me, which is a shame because I really liked this figure, in no small part thanks to the paintjob on it. The armor is finished in a very dark metallic color, and decorated with accents of dark, gory red, there is no face inside the helmet, so we get just to see a blank, black space in there. 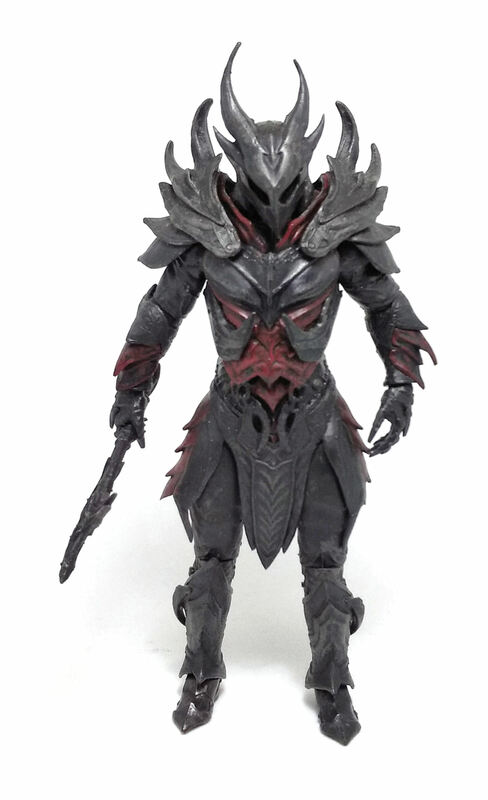 As far as accessories, the Daedric Warrior has only a small axe decorated the same as the figure itself. The design of the weapon doesn’t look too practical to begin with, but it fits nicely with the whole not-designed-by –humans feel I get from the armor. In the end, even though I love the look and feel of this Daedric Warrior, the underlying quality issues makes it really hard for me to recommend it, or even give it a passing grade. Otherwise, I would have gladly added forty more points to the score.